In just a few months, 19-year-old Pratik was going to appear for his 12th grade board examinations and be ready to take on the world. Recently, he met with a very serious accident and now, he is fighting for his life in the ICU. He cannot live without the much-needed medical attention, but his family’s financial condition is making it all the more difficult. On 1st February, Pratik met with a very serious accident while riding his Scooty. A trailer truck rammed into him and tremendous impact resulted in a severe head injury. His brain is extremely swollen in areas and he has been unconscious for almost a week now. Pratik is very critical and the doctors have no idea when he’d regain consciousness. 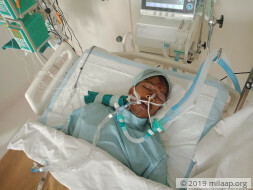 His parents who were shocked on hearing this, are trying their best to provide for his treatments as he has been supported by the ventilator in the ICU for over a week. Pratik has also suffered from multiple serious bruises on his body and face, which need constant medical attention too. Omkar, Pratik’s older brother, has been by his side at the hospital for the past week. In just a month, Pratik was to appear for his HSc. Board examinations and then move forward to pursue a degree in Automobile Engineering. He spoke a lot about this and his passion for the topic increased with every passing day. Suffering from a fatal brain injury, Pratik is now unconscious in a hospital and no one has a clue when he will open his eyes again. Since his brain has been severely affected, it’s also unsure if he’ll be able to regain some of his functionalities back. His entire life has turned upside down in a flash and now, he’s in the ICU and cannot survive without medical attention. The 19-year-old is unconscious and is assisted by the ventilator following his accident. His brain is suffering from a traumatic injury and in order to survive he needs to be kept in the ICU for the next few weeks. The costs, which just keep on increasing, are too hefty for his family to bear. His father, Kashinath, is finding it very difficult to help save his son and is running out of time to provide for the treatments Pratik needs. Kashinath works as a laborer and earns around Rs. 6000 a month. Through a meager salary, he has to provide for his 3 sons and his wife. Naina, Pratik’s mother, is a housewife. Their eldest son, Omkar, has just graduated and is looking for a job. They have absolutely no savings and are completely taken apart after seeing Pratik’s horrific injuries. The bills have already crossed Rs. 3 lakhs and after begging and borrowing from his relatives and friends, Kashinath has managed to pay only around Rs. 40,000. He has no financial means to provide for his son’s additional treatments and has exhausted all he has. The total cost for Pratik’s sustained treatments in the ICU is estimated to be around Rs. 8 lakhs. Now, Pratik’s family has no option but crowdfunding. 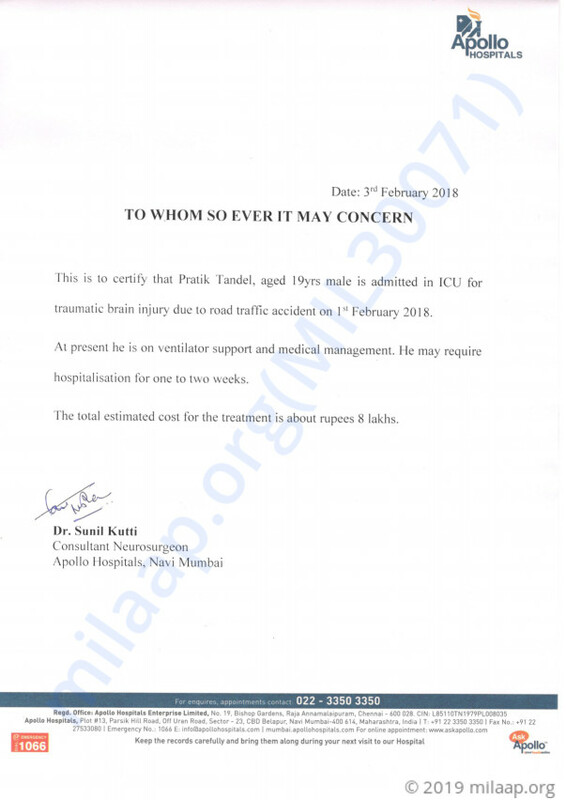 19-year-old Pratik’s condition is very critical. He is suffering from a horrific brain injury after being hit by a trailer truck. He needs to be kept in the ICU and treated for the next few weeks but his father has no way to provide for his treatments. He is now running out of time and needs your support. Your support will save Pratik.